[176 Pages Report] The industrial networking solutions market size is expected to grow from USD 7.99 Billion in 2016 to USD 23.84 Billion by 2022, at a Compound Annual Growth Rate (CAGR) of 21.0% during the forecast period. The base year considered for the study is 2016 and the forecast period is from 2017 to 2022. The main objective of the report is to define, describe, and forecast the industrial networking solutions market size based on components (technologies and services), application, deployment, vertical, and region. The report provides detailed information on the major factors (drivers, restraints, opportunities, and challenges) influencing the market growth. The report attempts to forecast the market size with respect to the 5 main regions, namely, North America, Europe, Asia Pacific (APAC), Middle East and Africa (MEA), and Latin America. The report strategically profiles the key market players and comprehensively analyzes their core competencies. Moreover, it tracks and analyzes the competitive developments, such as joint ventures, mergers and acquisitions, and new product developments, in the market. The industrial networking solutions market includes various vendors providing networking solutions and services to commercial clients across the globe. The companies, such as Huawei (China), Eaton (Ireland), Cisco (US), Dell EMC (US), Juniper Networks (US), Sierra Wireless (Canada), Aruba Networks (US), Veryx Technologies (US), ABB (Switzerland), Moxa (US), Belden (US), and Rockwell Automation (US) have adopted partnerships, agreements, and collaborations as the key strategies to enhance their market reach. The study answers several questions for the stakeholders, which market segments are expected to focus in the next 2 to 5 years to prioritize efforts and investments. 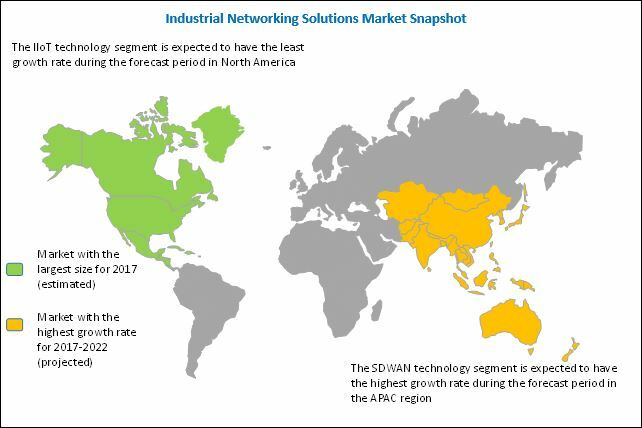 MarketsandMarkets estimates the global industrial networking solutions market size to grow from USD 9.18 Billion in 2017 to USD 23.84 Billion by 2022, at a Compound Annual Growth Rate (CAGR) of 21.0% during the forecast period. The major factors that are expected to drive the growth of the market include the growth in demand for Software Defined Wide Area Network (SDWAN) solutions and rise in need for predictive maintenance. In addition, the proliferation of wireless technologies in industry operations and advent of data analytics and data processing are some of the factors that are expected to boost the market growth. 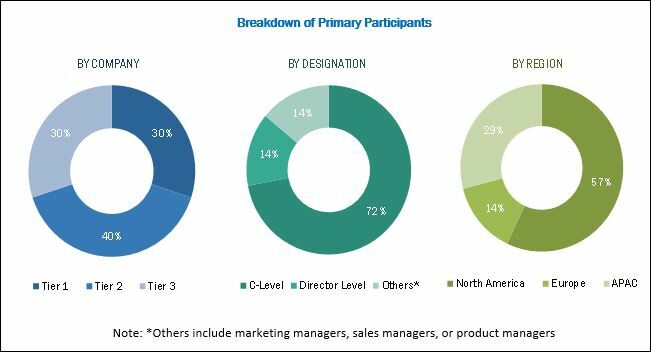 The industrial networking solutions market is segmented based on components (technologies and services), application, deployment, vertical, and region. In the component segment, the services subsegment is expected to account for the largest market share. Industrial networking services play a vital role in the deployment and integration of industrial networking solutions in a factory’s operating environment. In addition, services are considered as the backbone of industrial networking, as they are instrumental in fulfilling the clients’ requirements, such as network provisioning, network testing and auditing, network planning and optimization, network orchestration, support and maintenance, training and education, and network consulting. The predictive maintenance sub segment under the application segment is expected to grow at the fastest rate attributed to the fact that latest industrial networking technologies have provided a complete paradigm shift with respect to the operations and maintenance of the industrial equipment. The predictive maintenance application smartly identifies the primary variables through root cause analysis. It analyzes the assets’ performance and products’ quality. The aim of the predictive maintenance application is to improve the reflectiveness of every machine in the customer’s site and avoid machine failures and the associated consequences. The companies, such as Moxa have offered predictive maintenance applications, called proactive self-maintenance, which helps industries to monitor the health of the computers deployed in their Industrial Internet of Things (IIoT) enabled systems. The discrete industry sub segment is expected to account for the largest market share in the vertical segment attributed to the fact that IIoT technologies have enabled the discrete industry organizations to shorten their time-to-market and maintain a competitive advantage in the market. The discrete industry sub segment is involved in the manufacturing of distinct items, such as heavy machines, automobile parts, semiconductor and electronics, medical devices, and logistics and transportation equipment. The manufacturers in the discrete industry face challenges, such as the ever-changing customer expectations, accelerated time-to-market cycles, regulatory pressure, and increase in cost of materials. To address such challenges, the discrete industry companies have started using IIoT technologies and data analytics. The IIoT technology uses sensors fitted into finished goods to track the usage patterns and help the engineers view the usage rate of a product. Further, deeper insights are derived, by assessment of usage patterns and rate of a product, to improve the product design by identifying feature gaps, non-value adding features, use-case segments, and engineering pitfall. North America is estimated to account for the largest market share in the industrial networking solutions market in 2017. The factors that propel this growth include increase in adoption of smart connected devices, Industrial Internet of Everything (IIoE), and agile networks. Moreover, different stakeholders, such as industrial networking solution providers, Managed Service Providers (MSPs), technology consultants, and network operators, have partnered with major players to enhance the organizational networking ecosystem in North America. For instance, Aruba Networks partnered with Tillamook County Creamery Association (TCCA), a manufacturer and seller of dairy products. This partnership enabled TCCA to deploy an all-wireless network at its new Portland, Oregon office. After the US, Canada is expected to account for the major share in the industrial networking solutions market in North America. The Canadian companies have improved and optimized their network processes by utilizing industrial networking technologies. For instance, in September 2017, Sierra Wireless, one of the industrial networking solution providers in Canada, introduced LTE-Advanced Pro cellular modules to offer fast IoT applications for mobile computing, networking, and industrial Machine-to-Machine (M2M). Asia-Pacific (APAC) is expected to grow at the highest CAGR during the forecast period attributed to the fact that it has witnessed the fastest growth rate, owing to the rapid development of the network infrastructure. Moreover, this region has witnessed robust initiatives to upsurge the industrial networking infrastructure in different countries. For instance, IIoT initiatives in Singapore form a part of a larger Smart Nation Initiative, which is expected to help foster stronger communities, create job opportunities, and improve public services. Data security and privacy concerns are expected to be the major restraining factor for the growth of the industrial networking solutions market. However, the recent developments, such as new product launches and acquisitions, undertaken by the major market players are expected to boost the market growth. The study measures and evaluates the major offerings and key strategies of the key market vendors, including Huawei (China), Eaton (Ireland), Cisco (US), Dell EMC (US), Juniper Networks (US), Sierra Wireless (Canada), Aruba Networks (US), Veryx Technologies (US), ABB (Switzerland), Moxa (US), Belden (US), and Rockwell Automation (US). These companies have been at the forefront in offering reliable industrial networking solutions to commercial clients across diverse locations. *Details on Business Overview, Solutions/Services Offered, Recent Developments, SWOT Analysis, MnM View Might Not Be Captured in Case of Unlisted Companies.